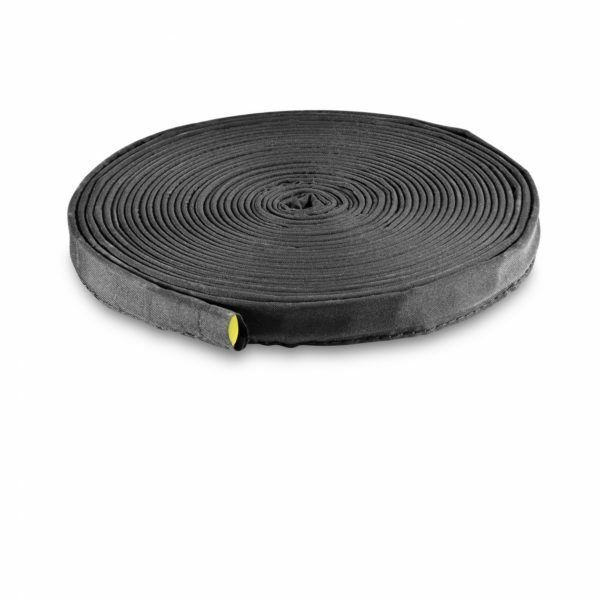 The 10m long soaker hose is perfect for efficient watering of hedges and bushes. The hose is free of phthalates anprovide even pressure along the whole hose, even when extended to 50m. The Kärcher 10m long soaker hose is part of the Kärcher Rain System. The water drips out of the hose evenly over the entire length, landing precisely where it is needed, and thus ensures extremely efficient watering of hedges and bushes. The hose can be shortened to suit requirements and extended with the aid of I-pieces or branched with T-Connectors (max. hose length: 50 m). A T-Connector is especially recommended for connection to the Kärcher Rain System. Thanks to the laterally adjustable tee, the required water quantity for the soaker hose can be optimally adjusted. The two-ply hose is free of phthalates, cadmium, barium and lead and is thus harmless to health. Ideally, the hose is operated with up to 2 bar. Installing the hose is very easy and does not require the use of tools. The Kärcher Rain System combines the advantages of micro-dripping and conventional watering, works with up to 4 bar pressure and can be individually adapted to almost any type of garden. The soaker hose can be buried under a loose layer of soil up to 5 cm deep.